Trumpeter Swan Project - Earth Ltd.
We are excited to announce our partnership with the Iowa Department of Natural Resources’ Trumpeter Swan Restoration Project. Along with Southwick’s Zoo, we are working to help restore the trumpeter swan to its native habitat in Iowa. Trumpeter swans, the largest waterfowl species native to the United States, once nested throughout Iowa. However, as a result of unregulated hunting and wetland drainage, the species experienced a dramatic decline in numbers. Until 1998, the last wild nesting trumpeter swan in Iowa was documented in 1883. The Iowa Department of Natural Resources developed a plan to restore this species to Iowa in 1993, with the goal of having 15 free-flying nesting pairs by 2003. By 2017, about 1,220 swans had been released in over 80 sites in the state. EARTH Limited and Southwick’s Zoo are proud to have the opportunity to help restore this species to its native habitat. Learn more about the restoration program. As with other zoological facilities partnering with the restoration program, cygnets born to Southwick’s Zoo’s breeding pair of trumpeter swans will be transported to Iowa to be released back into their native habitat. Three cygnets were born at Southwick’s in 2018. The cygnets remained in the zoo until October when they were large enough to be transported to Des Moines, IA. The swans were next brought to Nora Springs, IA to a fenced-in 18 acre area that will serve as their temporary home while they become acclimated to their new landscape and develop their survival skills. 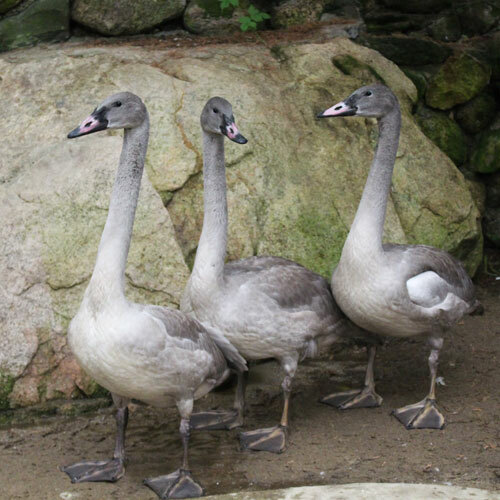 The three swans from Southwick’s, along with swans from other program partners, will be released into southern Iowa in May of 2019. Staff from EARTH and the zoo will travel to Iowa for the release, so keep an eye out for more updates and news! Not all swans in the United States are native to North America. You’ve probably seen swans here in New England, however these are likely mute swans. Unlike trumpeter swans and tundra swans , mute swans are actually a non-native species. These European birds were brought to the United States during the late 19th century to be used as an ornamental species to decorate parks and estates. 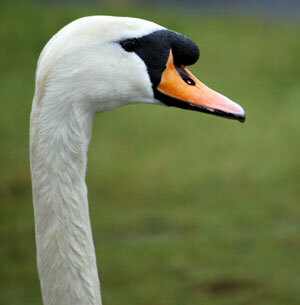 Mute swans create competition with local wildlife, so they are considered invasive in many areas. The easiest way to distinguish a mute swan from a trumpeter swan is by the color of its bill. Mute swans have orange bills, while adult trumpeter swans and tundra swans have black bills.